These stainless steel tanks are important for the agricultural, pharmaceutical, chemical and food processing industries, holding grain, dry chemicals or granulated sugar, for example. Stainless Steel Bins – Frain Industries, Inc.
Bins are also essential to the industrial and manufacturing industries, where they are used for transport, storage and recycling applications. The capacity of a stainless steel bin varies; the average range is about 20 to 50 cubic feet. Constructed out of stainless steel, bins are strong, non-porous and resistant to corrosion. The two types of storage for bins include stacking and hanging, and bins are usually either rectangular boxes or open-top containers with a hinged lid, flat sides and a sloping bottom. For ease of use and convenience, many of these open top containers are mounted on a portable base or on a stainless steel frame with casters which allows the contents to be transported without puncturing the bin itself. Many of these bins act like a hopper and have a door in the conical bottom that can be slid open to release the contents at a controlled rate. To make bins, a minimum of 10% chromium is added to steel along with other alloys, and the metals are melted together. Once the molten metal becomes uniform, it undergoes a series of cooling and reheating until hardened. After being cut to size and cast into the correct shape, the stainless steel is welded together to form a box or cylinder. Welding the pieces together ensures that there are no seams and no opportunity for bacteria or leaks. 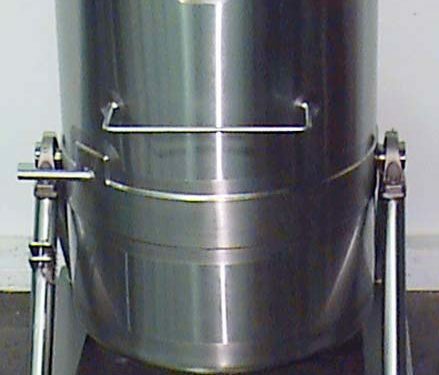 Very similar to the stainless steel bin is a tote, also called an intermediate bulk container (IBC). These are containers use to store and transport fluids. Stainless steel totes are typically 10 gauge or about 3 millimeters thick. Totes are generally box-like in form and can be stacked much like the rectangular bin, though cylindrical IBCs are also available to ship smaller quantities. Totes and bins are sometimes used interchangeably, though totes are specifically designed for liquids. Both containers have multiple openings for input and discharge, though IBCs have tighter seals Totes generally weight between 200 and 3000 pounds and have bases designed for use by forklifts. IBCs frequently carry hazardous materials, soap, glue and some foods. Unlike 55 gallon drums, totes are easy to load and are more durable. Stainless Steel Bins In general terms, stainless steel bins are durable metal containers used to hold and transport dry goods. Bins vary in size, shape and usage and are used in a wide variety of settings.